Too much information? Start here: basic instructions. So how do you really grow a giant pumpkin anyway? Well if you ask 10 experienced growers this question you will probably get a variety of answers. However, the four things most of them would include are (1) Good Seeds, (2) Good Soil, (3) Hard work and (4) Good Luck! Here are some basic steps but BigPumpkins.com is dedicated to teaching techniques to all growers including beginners. If your interested on how to do any of these steps or want to see how I do them your are welcome to send me a message at billf(at)bwig(dot)net or give me a call (I'm in the phone book) and come visit my patch. Did you know that last year's world record pumpkin weighed a whopping 1469 pounds? 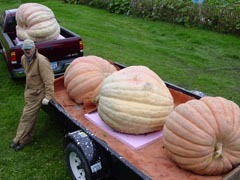 Most of the world record pumpkins in the last twenty years have been produced in backyard gardens like yours. Here are several steps for you to try growing a giant of your own. 1. Site/Soil Preparation - The site should be level, well drained and located in full sun. The best soil type is loam. It is good to have your soil tested and apply necessary lime and fertilizers per test recommendations. Contact the Local County Extension service for soil test information. Also add organic matter such as manure or compost to establish good soil structure. It's best to work soil in the fall. If that's not possible, do so as soon as weather permits in the spring. For these giants to grow to maximize size each plant will require at least a 25x25x25 triangle area, you can squeeze in two in a 35x 35 area. 2. Seeds - if you plan on growing world-class pumpkins you will need to get seeds from world class growers, you can find them on BigPumkins.com, Seedoutlet.com or contact me. Option 1 Prior to planting soak the seeds in warm water for 4 hours and plant directly outside about May 20 in Zone four or a few days after your last average frost date.. When planting outside, make a two-foot circle, remove the top inch of soil, place five seeds flat in the circle, and cover one inch deep. It is extremely helpful to create a small greenhouse over the planting area for several weeks' prior to planting and several weeks after seedlings appear. This will warn the soil and protect the seedling. Then select the strongest plant and remove the others. Option 2 Seeds may also be planted indoors in four to six-inch peat pots around April 30. Plant flat one inch deep in lightly moistened lightly soil and keep at 85 degrees and until it sprouts. (Usually 3-5 days) Place under (6 inches) a florescent light and transplant into the garden when the first true leaves appear (usually 3-5 days after germination) and handle with care, as they are easily set back during transplanting. You stand a better chance of getting a jump on the season when planting indoors. The main wine will grow to the opposite side of the first true leaf, position the first true leave to the back of the garden. 3. Protect seedlings - Protect the plants from frost and wind until they are well established. To secure the young vines and plants provide stakes in an X fashion over them to keep them from twisting. Covering the vines with soil to secure and to promote secondary root growth works extremely well. Creating windbreaks or selecting a site with natural windbreaks helps protect the plant. 4. Pruning – The idea is to have the plant grow in a triangle. To do this will let the main vine grow straight for 25 ft and the secondary vines will be pruned at 12ft, 10ft, 9ft etc from the main vine. Every other secondary on each side will be removed by just pinching it off and allow no vines to grow off of the secondary. This is easily said but very hard to accomplish. If the vine gets to big you can cut off the end of the vine, and bury them (deep) in the ground. 5. Adjusting the vine - Turning the vine is usually necessary to get it growing in the correct direction. You can easily make the vine go where you want it to by using sticks to slowly turn it by applying light pressure. I would suggest that you adjust the vine to get the pumpkin perpendicular and as a last resort move the pumpkin. And if moving the pumpkin is your only option do it a little each day. 6. Water/Fertilizing - Pumpkins are shallow rooted and need at least one inch of water per week or more during hot dry periods. Each pumpkin is ninety percent water. It's best to water in early evening, but allow the plant time to dry before night. Add water-soluble plant food during watering; 15- 30-15 plant food during May and June to promote root growth: 20- 20 -20 during July: and 15-10-30 to the end of the growing season. Your soil test will determine how often to fertilize, I usually do it weekly but only at half strength and I mix it with other natural products, like seaweed and fish oil. 7. Weeding - Weed control is essential for seedlings to become established. However, once the plant has grown the large leaves they will block out the sun and keep the weeds under control. It is important not to use a tiller in the patch once the plants are growing, as the shallow roots travel a long way in the loose soil. 8. The Giant Starts - Pollination may occur naturally through bees and other insects or through assisted pollination. Around the first of July select two or three pumpkins on the main vine 10 to 12 feet from the main root. Around July 20 select the fastest growing pumpkin and remove all other pumpkins from the plant. Select a pumpkin with a good round tall shape and positioned perpendicular to the vine with plenty of room to grow on all sides. You can put something under your pumpkin; many just use sand, I used siding installation that has many holes. The object here is to keep the pumpkin dry, don't let it sit in the mud. 9. Watch Them Grow - Check vines every two days and remove any new pumpkins that have started. It is very important to remove the roots on the underside of the vines four feet in both directions of the pumpkin. This should allow room for the vine to move without breaking the stem as the pumpkin grows to giant status. If the vine starts to tighten it may be necessary to carefully move the vine. I support my vines leading to the pumpkin stem with Styrofoam. 10. Covering - It is a common to cover pumpkins to protect them from the sun. The sun will harden the skin and reduce the growth and increases the splitting potential. Use a tarp on posts and go over the top, which allows very little rain or sun to get to the pumpkin. Some top growers just use a white sheet and put it on the pumpkin. 11. Diseases and Pests - Growing "the big one" requires a proactive and preventative approach to problems. DO NOT water in the evening with an overhead watering system as this will cause mildew problems on the leaves and greatly reduce their capacity to feed the pumpkin. Insects such as vine borers, squash bugs and cucumber beetle larva will greatly harm the chances for success. Dust a two-foot area around the main root with an insecticide such as rotenone at the start of the growing season. I usually start to spray insecticides on all foliage every two weeks in early June and switch types of insecticides every month. Follow label directions when applying any pesticide, insecticide, fungicide or herbicide. 12. Harvest - When the weather turns cold protect "the big one" from freezing. Moving these giants is fairly simple with the help of a few friends. Roll "the big one" onto several blankets or tarps. Lift the corners of blanket or tarp and move to a new area. The bigger the pumpkin the more blankets and friends needed. Sound advice up to 500 lbs but after that start looking for a friend with a loader. 13. Information - There are many little tricks that I’ve learned over the years but they are all covered and then some on growing these garden giants, read Don Langevin's How to Grow World-Class Giant Pumpkins or go to www.bigpumpkins.com and read featured growers information. Or ask some of the other growers in the area or contact me, we all want you to be successful. If this is your first year of growing Atlantic Giants I would strongly advise that you try to take care of only two plants. You can plant more but focus on two. Believe me, come mid July these plants really grow, and by the end of July you will already have your favorites to focus on. What do these numbers mean 576 Foss 06 576=Weight of pumpkin (lbs), Foss=Grower, 06=Year grown Female = Growers Seed that produced the plant/pumpkin Male = Growers seed that produced the male flowers that pollinated the pumpkin. Each of these seeds has the potential of producing 1000+ lbs pumpkins. If you order seeds from me, you'll be getting these seeds. I will make every attempt to verify each order recieves seeds from all the pumpkins below. WOW!!! Look at these crosses; those are some mighty big parents.